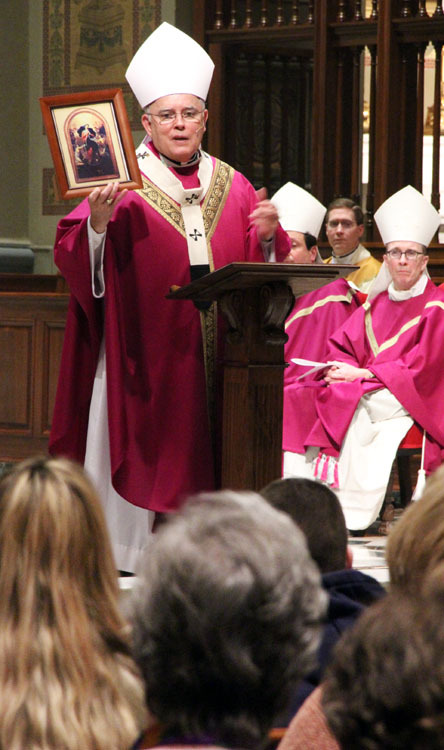 Archbishop Chaput shows the congregation the picture our new Holy Father had given him after he met him years ago. 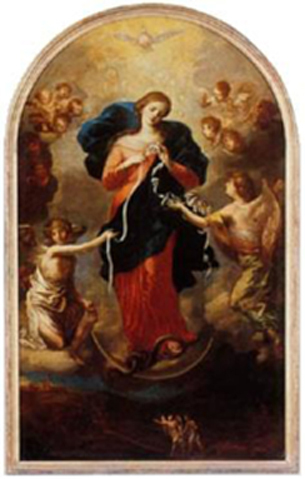 Chances are, you never before heard of devotion to “Mary Untier (or Undoer) of Knots.” You are apt to hear a lot about it in the future because it happens to be a favorite devotion of Pope Francis. Archbishop Charles Chaput already knows about it because he has on his desk an image of it given to him some years ago by the future pope. The devotion takes its name from a painting by the German artist Johann Georg Schmidtner executed around 1700 and placed in St. Peter am Perlach Church in Augsburg. The painting was commissioned by a donor who had received the solution to a vexing personal problem through intercession to the Blessed Virgin. Six feet in height and almost four feet in width, the original depicts the Virgin who is untying a knotted rope, surrounded by angels. As in many other images of Mary, her feet are crushing a snake. Since the 18th century there has been a local devotion to Mary Untier of Knots in Germany, but in recent decades it has become widespread in Argentina and Brazil. According to some accounts it was first introduced to South America by German immigrants; by others it was done by Father Jorge Mario Bergoglio, S.J, the future Pope Francis, who studied theology in Freiburg in the 1980s. What is beyond doubt he is considered the person most responsible for making the devotion popular in South America. Shortly after Cardinal Joseph Ratzinger was elected Pope, as Benedict XVI, Cardinal Bergoglio presented the German-born Pope with a silver chalice engraved with the image of Mary Untier of Knots along with the Virgin of Our Lady of Lujan, another popular Marian devotion in Argentina. Now that he has been named Pope himself a similar chalice will be presented to Pope Francis by the people of Argentina, according to the Buenos Aires Herald. Archbishop Chaput’s acquaintance with Pope Francis traces back 16 years. The Holy Father at the time, Pope John Paul II, invited 120 bishops from North and South America to come to Rome for a month to discuss the New Evangelization. Archbishop Bergoglio was named Archbishop of Buenos Aires a few months before Archbishop Chaput was named Archbishop of Denver, and because Vatican protocol calls for seating by date of appointment, they were seated in the same row and got to know one another. Over the course of the years they exchanged correspondence and Cardinal Bergoglio sent him a picture of Mary that Archbishop Chaput placed on his desk.